Can you guess which country this is describing? This is a two page, front and back copy. You should print page 1 and flip the paper over to print page 2. 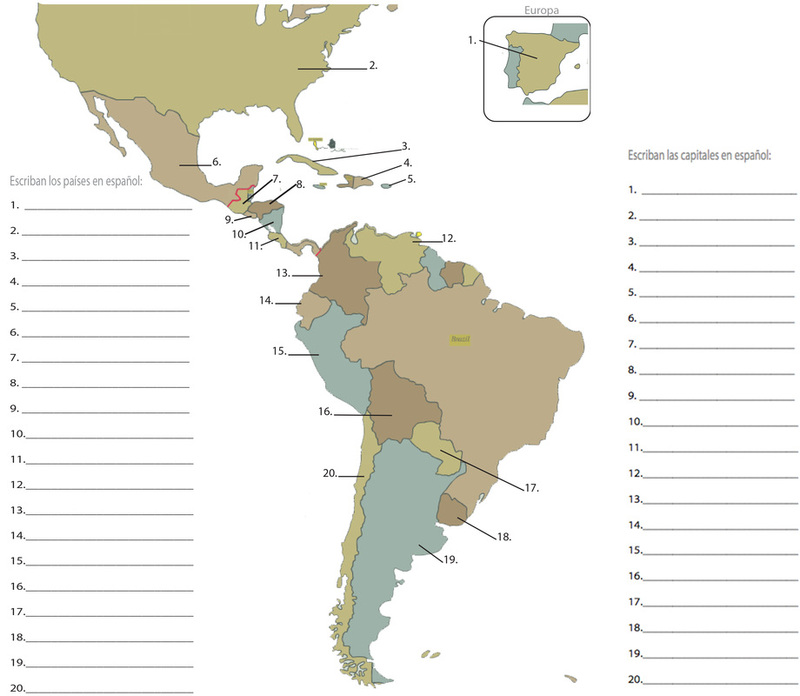 Can you figure out which Spanish speaking country was the only one you did not have to name on this map? What is the capital of that country? Los abuelos de Elsa son de Managua. Ellos son ____________________________________. Jorge es de San José. Él es ____________________________________. Mónica es de La Paz. Ella es ____________________________________. Ángel es de Lima. Él es ____________________________________. Yo soy de EE.UU. Soy ____________________________________. Gustavo y sus amigos son de Madrid. Son ____________________________________. Jimena es de Santiago. Ella es ____________________________________. Mis padres son de San Juan. Ellos son ____________________________________. Mi abuela es de La Havana. Ella es ____________________________________. Ignacio es de Tegucigalpa. Es ____________________________________. Mi profesora es de Caracas. Es ____________________________________. Su profesor es de Santo Domingo. Es ____________________________________. Los niños son de San Salvador. Son ____________________________________. Mariana y Iván son de Quito. Son ____________________________________. La mujer es de Montevideo. Es ____________________________________. Most of the vocabulary practice for 1-V-2 is woven into grammar lessons 1-3. Translate these sentences spelling out the numbers. Listen to Alicia describe her best friend. There will certainly be some words that you may not understand and even some verb tenses that you have not learned yet, but try to listen and pick up the key important points of her description (Comprehensible Input) and answer the following questions. ​If you were going to write a song called "Soy yo", what would your lyrics be in Spanish. Do not use google translate. Use the vocabulary you know. If you need to look up A WORD or 2, be sure to use the Collins dictionary button at the bottom of the home page. (minimum 5 sentences).